When it comes to hair, I'm a simple gal. Lately, I have spoken quite a lot about my hair, but in reality is not something that I tend to priortise. It comes as no surprise why though. Most of my mornings consist of getting up, rushing to get my daughter her breakfast, into her uniform, getting myself ready and out the door before 8 am. A few hours to try and get some work done before going back to collect her from nursery which is followed by afternoons full of playgroups or baking sweet treats. So it come as no surprise that my hair is not up there on the to do list. 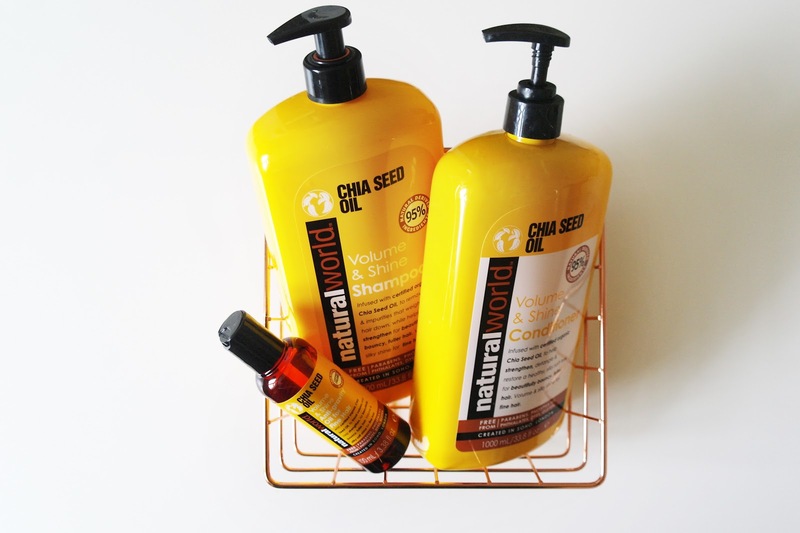 I was recently introduced to Natural World The one thing that had me intrigued immediately was the Chia Seed Oil range. 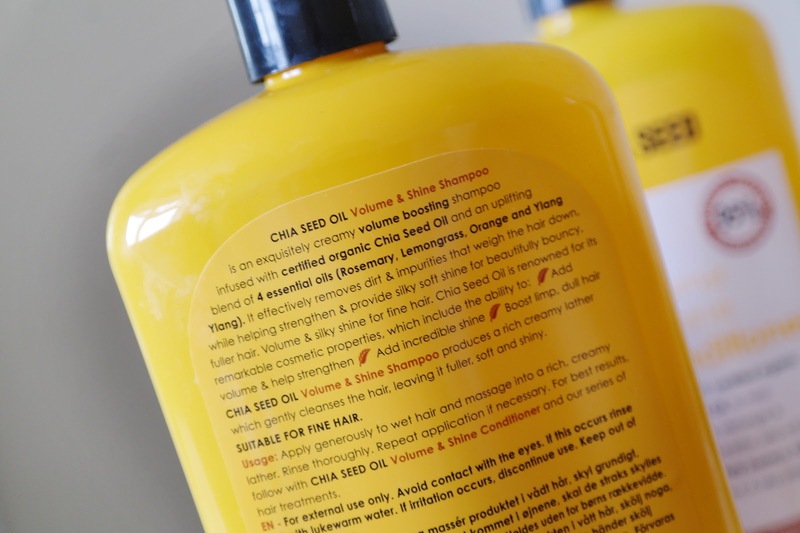 I mean I've heard of chia seeds before, but I have never tried them in my haircare products. So when the brand contacted me asking whether I would like to try the range, of course I was delighted to take part. 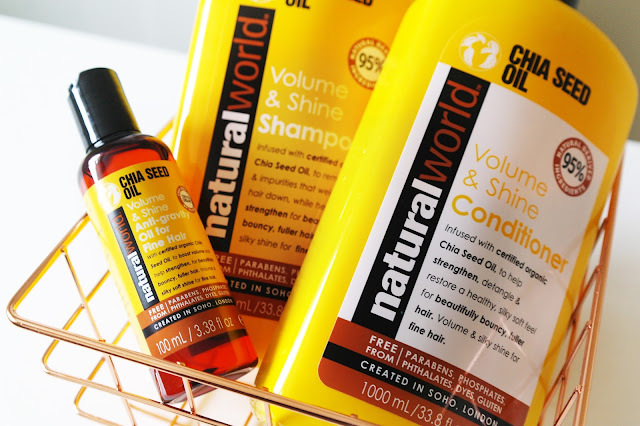 The Chia Seed Oil range promise to give hair lots of volume whilst maintaining a high shine, something that I needed for my dull hair at the moment. So first of all the brand Natural World was created in the heart of Soho, London by leading hair experts focusing on using naturally active ingredients from around the world. They have products for all types of hair and for all types of hair conditions. Their products are made for 95% natural ingredients. These products are free from parabens, phthalates, dyes and gluten. The brand offers affordable yet luxurious hair care to suit every hair type. With such a huge variety of ranges I have no doubt that you will find something for your hair needs. 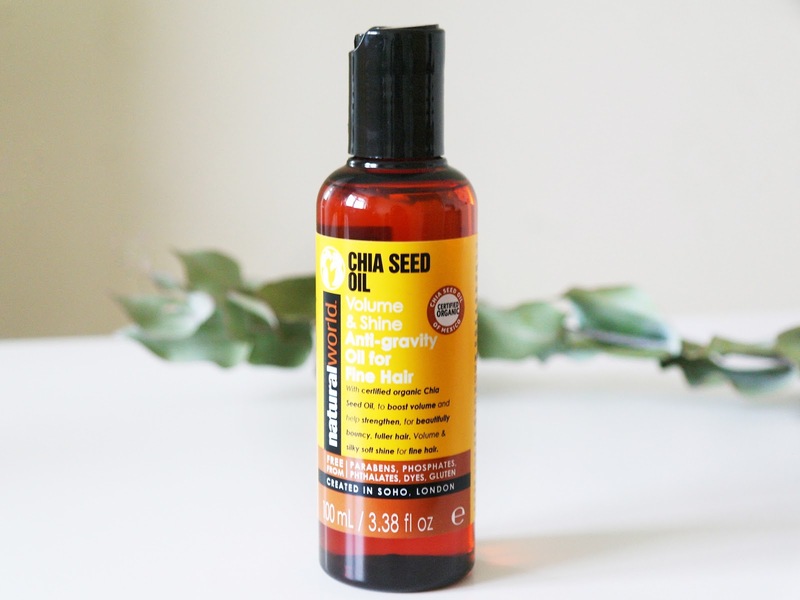 The Chia Seed Oil range that I have here focuses mainly on adding back volume to your hair. The main ingredient chia seed oil is organic certified which is fantastic and of course it's what helps to boost volume whilst strengthening hair at the same time. Some of the other main ingredients such as Cedarwood, Lemongrass, Rosemary, Orange & Ylang Ylang are also quite promising as they promote hair growth, boost circulation in the roots, soothe the scalp & balance out the natural hair oils. The idea of this range something that really appeals to me. I have always struggled with oily roots and dry ends I could even go on to say straw like ends that break so easily. I have tried no end of products to try and nourish my dry ends but these can leave my roots looking very greasy, so greasy that it doesn't always even look as if I wash my hair. I wash my hair far too much, every other day! So I want to use something that will combat these problems and help boost my roots volume. I have been using the range for quite some time and I can already notice a change in the condition of my hair. Without a doubt it has given my hair some volume, using both the shampoo and conditioner has helped battle the grease by leaving my hair super fresh and clean. 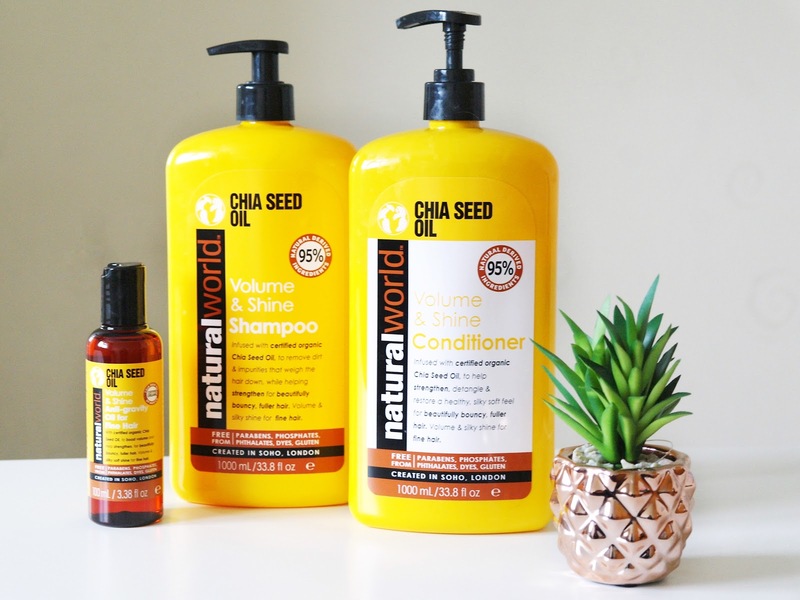 With the Chia Seed range is that during the washing and drying process my hair gets tangled quickly, so it takes me a little longer when it comes to brushing, drying and styling my hair. However once it is styled you can see the results. But within a few washes of using the shampoo & conditioner duo, I could definitely noticed that my hair soon started to look dry. So I decided to add this duo into my haircare routine twice a week and I have found that this suits my hair much better because not only am I getting the hydration my hair needs but I am also maintaining the volume to it. I've definitely found the right balance by using it every few washes and it suits my hair needs perfectly this way. I must admit my favourite product was the Chia Seed Oil, and it's not oily by any means. It feels similar to Percy & Reed's No Oil Oil. It is quite dry and is a perfect product to tame the frizz after using heat in hair, which normally is crazy after 20 minutes of blow drying. It has a nice delicate fragrance too and a few drops are enough to coat my hair and I have long hair. After every use, my hair feel very soft to touch and shiny and my hair is more manageable without a doubt. Natural World products are good option if you want to try natural based products. They are easily available and are cost-effective. Natural World products are available in Tesco. I was sent the 500ml bottles of shampoo and conditioner but only 1L bottles are available in stores for £5 each. 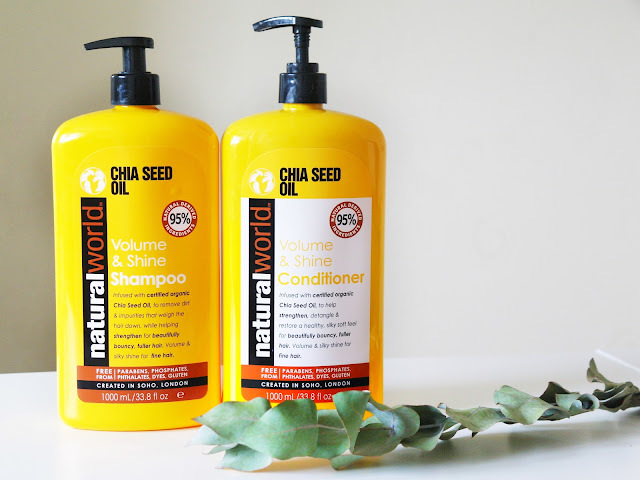 6 comments on "Natural World: The Chia Seed Oil Range"
I've never heard of this brand until now! I love the whole sound of the brand and these bits sound lovely! Oh wow, would love to try this! It sounds amazing!